While SIDI is great at producing quality boots for racing and touring, they also have a knack at producing casual shoes for the urban and suburban riders. 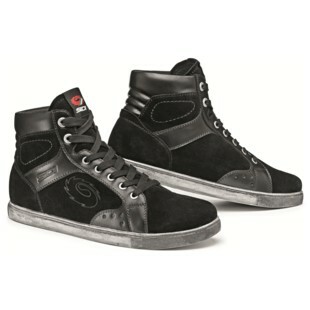 The latest in their line of casual shoes for urban riders are the SIDI Frontera Riding Shoes. Meeting the needs of commuters and casual riders alike, the Frontera Riding shoes have a sporty, style-conscious look while providing some crucial benefits that you just can’t get from your pair of Chuck Taylor's. These high-top, suede and leather paneled shoes feature internal inner and outer ankle protective caps, internal reinforcements at the heel cup and the toes, and a non-slip rubber sole. Available in three different colorways, the SIDI Frontera shoes provide riders with the option of all Black, White / Blue, or White / Tan. If riding makes you feel cool (as it should -- because it is!) and you want a look to match, the SIDI Frontera Riding shoes will definitely do the trick.